Manhattan (8-9; 5-3 MAAC) makes the short trek to Quinnipiac (10-8; 4-5 MAAC) on Friday, Jan. 23 at 7 p.m. in a game that will be televised nationally via ESPNU. #1 – The Jaspers will be looking for their third-straight road victory while also rebounding from Sunday’s heartbreaking overtime loss to Rider. #2 – Shane Richards will look to continue his impressive play of late as the junior guard has hit for at least 20 points in each of his last three games. #3 – Each of Manhattan’s last five games have been decided by 10 points or less while six of the Bobcats’ last seven games have been decided by the same standard. 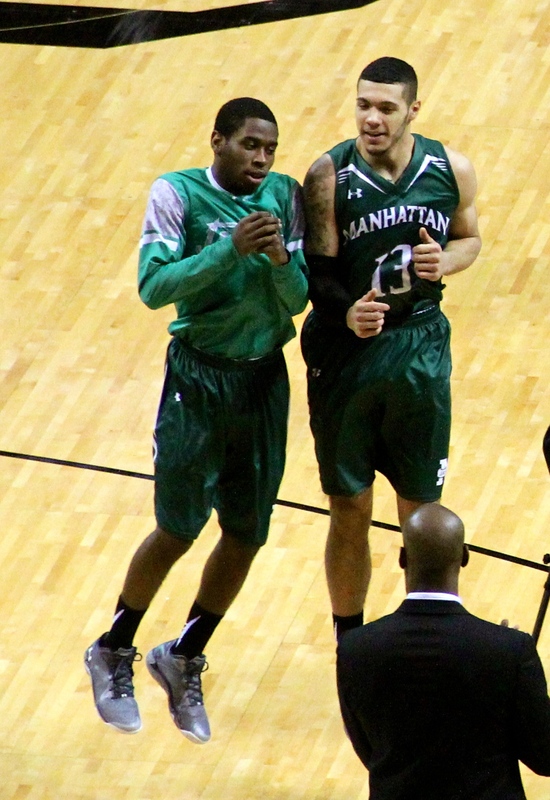 * The Jaspers’ last two games have gone to overtime, marking the first occurrence since the 1986-1987 season. *Manhattan has won two-straight on the road after starting the season 0-6 in true road action. * Quinnipiac leads the all-time series by a 2-1 count and won both regular season meetings a year ago before the Jaspers posted a decisive 87-68 win in the MAAC semifinals. * In the aforementioned victory, senior Emmy Andujar exploded for 21 points off the bench while also adding six rebounds and two assists. * Manhattan continues to rank fifth nationally with 17.2 forced turnovers per game and has pressured the opposition into at least 16 miscues in 12 of its 17 games while also placing 66th nationally with a +1.9 turnover margin. * The Jaspers shot a season-best matching 50.0 percent (26-of-52) against Rider and made good on least 70 percent of its free throws for the fourth-straight game after doing so just twice in the previous 13 games. * Andujar and Richards each notched 21 points in the Jaspers’ last game and have each hit for at least 20 in each of the last two games and were joined in double-figures against Rider by junior Ashton Pankey, who delivered 18 points and a game-high seven rebounds against Rider. * The trio netted 60 points against the Broncs while shooting 55.3 percent (21-for-38) from the field and have now each hit for double-figures in the same game on three occasions. * Andujar (5), Richards (5) and Pankey (1) have also combined for 11 20-point games while accounting for 31 of Manhattan’s 40 double-figure scoring performances. * Sophomore Tyler Wilson had a solid game off the bench against Rider, finishing with five assists and has now handed out at least four on eight occasions. Wilson continues to rank among the MAAC leaders in assists (3.1-7th), steals (1.2-13th) and assist/turnover ratio (1.3-6th). * The Glass – Manhattan will have its work cut out for it on the glass against a Quinnipiac unit that leads the Division I ranks in rebounding margin with a +13.5 mark. Senior forward Ousmane Drame leads the charge with a MAAC-best 10.5 rebounds per game and will need to be contained. * Contain Hearst – Senior Guard Zaid Hearst is notching a team-best 19.9 points per game and averaged 20.0 points, 5.7 rebounds and 2.0 assists against the Jaspers a year ago. * Three-Point Defense – The Jaspers check in with the best three-point defense (.305) in the league and will be facing a Bobcat squad that is averaging just 4.8 triples per game. * The Line- Manhattan must play smart defensive basketball and not turn the game into a free throw contest. Quinnipiac has converted on at least 70 percent from the line in each of its last 17 games en route to posting a MAAC-best 77.3 percent mark from the charity stripe. Manhattan returns home to host Monmouth at Draddy Gym on Sunday, Jan. 25 at 2 p.m.